I sympathize with the marketing team for Killing Gunther. On one hand, revealing that Arnold Schwarzenegger is in the film and cutting the trailer to make it look like he has a big role will get people to watch, but is misleading. On the other hand, it’s unlikely anyone would have given this film a chance without revealing Arnold. That’s a tough choice, but now that I’ve seen the movie, I wish I hadn’t seen the preview, because it diminished the one genuinely refreshing moment in the story. Outside of that, Killing Gunther is mediocre. Blake (Taran Killam) is a hitman who styles himself after urbane and refined assassins, like James Bond. But in his industry, Blake isn’t the best. That title goes to Robert “Gunther” Bendik (Arnold Schwarzenegger), and Blake wants to take that title from him. To accomplish the task, he hires a team of killers and enablers, like explosives expert, Donnie (Bobby Moynihan), sniper Sanaa (Hannah Simone), and a number of other specialists. To ensure that the world knows he was the one who killed Gunther, Blake hires/forces a camera crew to document the endeavor. Unfortunately, the team quickly finds out why Gunther is the best. Killing Gunther is obviously a comedy, but in the world of mockumentaries, Christopher Guest is the best, and Taran Killam falls short. The issue is that the scenes all feel too scripted. As a result, the writing (also by Killam) telegraphs almost every joke. The bits that are surprising are also absurd or nonsensical, like when a hitman is able to disguise himself as anyone – even someone who is physically smaller – or when a hitman wears a woman’s disguise without shaving his beard. Instead, the actors should have developed characters and been given games to play while getting to an objective every scene. Then see what kind of comedy ensued from the improvisation. The comedy in a film like Killing Gunther should have been watching how hitmen behave when not killing. Seeing these extreme personalities with unique professions suffering from the same mundane issues normal people do would have been funny in honest and sublime ways. The rules of this universe are inconsistent. The film flirts between stylized realism and over-the-top cartoonish action. In one scene, the poison specialist tries to throw a vial of poison at Gunther from 100 meters away and is castigated by his team. But then later, the same poison specialist demonstrates how he’s able to move so quickly that he’s almost able to be in two places at the same time. It’s played for a cheap laugh and not meant for anything more, but it made me wish the film kept going in this direction. I liked the idea of a team of misfit hitmen who sucked at their job but had one special trait that complemented everyone else. Only by working together and exploiting their singular abilities could they take on Gunther. Unfortunately, that doesn’t happen here. The best part of the film is, of course, Arnold Schwarzenegger. Unfortunately, all of his best bits are given away in the trailer. Nevertheless, he lends his larger than life personality to the role and it fits well. He might as well be playing himself, which would have been an interesting twist – explaining that all of the training to kill he did for films was a cover for his real job as a hitman. It certainly would have made the callbacks to his famous movie lines make more sense. Alas. Despite my criticisms, I still recognize the charm throughout the film, and I can see how a limited budget was maximized. There are also some clever uses of the documentary style that were genuinely surprising. The cast also does an adequate job with their roles and the script. 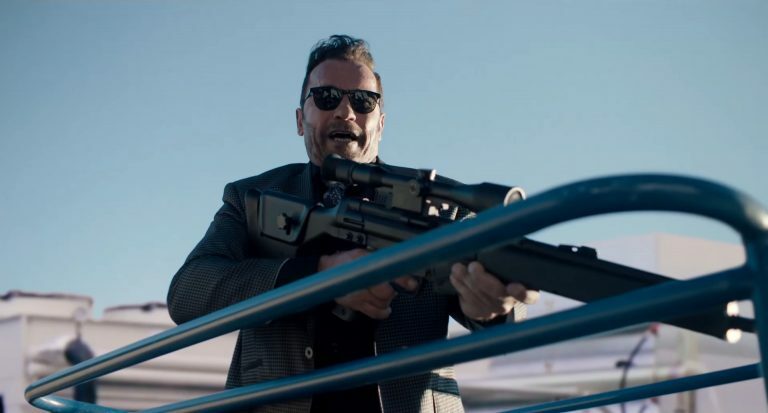 Killing Gunther just never rises to the level it needs to in order to get the laughs the audience desperately wants to have. It’s not bad, but it’s not good. It’s just watchable in a forgettable way.